Do you want to see your customers or other addresses on a map? Is your data currently in an Excel file or within a customer relationship management system (CRM/ERP)? Using portatour® sales-route mapping software, it’s a breeze to import your address data, automatically geocode it, and show it on a map. Colors can be used to indicate a customer’s revenue, industry, call frequency, or other criteria. Additionally, an individual symbol can be assigned to each customer. If you do field sales and visit the customers, portatour® can calculate an optimized route for you. Read on to find out the possibilities that portatour® route mapping software offers for geomarketing and route-planning. In this first example, you see customer data imported from an Excel file displayed on a map. 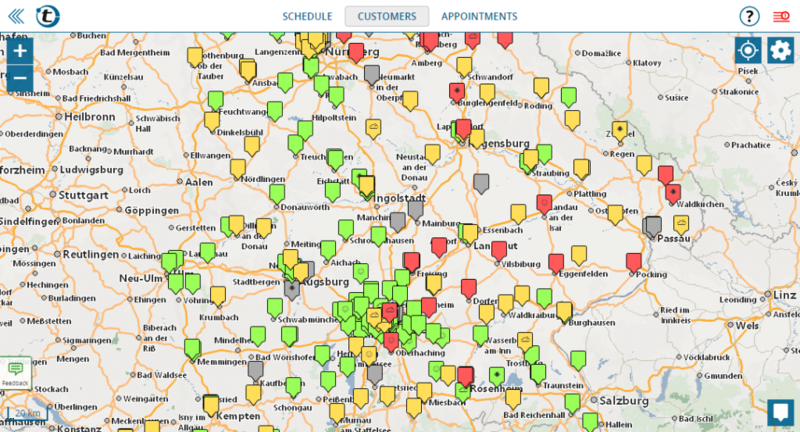 Customers are colored by “urgency for field sales”: customers ripe for a visit are yellow and red; customers recently visited are green. Additional symbols indicate important customers. portatour® supports importing addresses from Excel, OpenOffice, and text/CSV-files. An import wizard guides you step-by-step through the customer import process. portatour® is adaptive when importing data: the columns in the imported file do not have to conform to a predefined schema. Rather, the columns of the file are matched to the fields in portatour® once during the import process. Alternatively, customer data can be imported directly from Salesforce, Dynamics CRM and other CRM/ERP systems. Learn more about importing customer data. 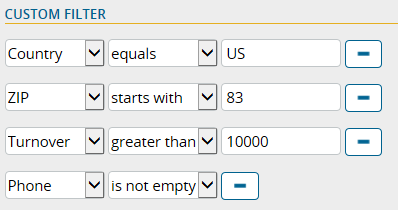 In addition to importing addresses, portatour® supports importing custom fields. Import data regarding the revenue, industry, potential, call frequency, etc. of your customers to color them according to these criteria on your map. In the following example, the customers are shown by revenue-class. Important customers with higher turnover are darker. This article shines only a brief light on the many ways of using portatour® with your customer data. portatour® is also a route planner for field reps and outside sales. It automatically calculates how to visit as many customers as possible with minimal driving time. Easy entering of call reports and auto-generated performance-statistics make portatour® the perfect tool for mobile field representatives. Read more about the portatour® sales route mapping software at www.portatour.com .